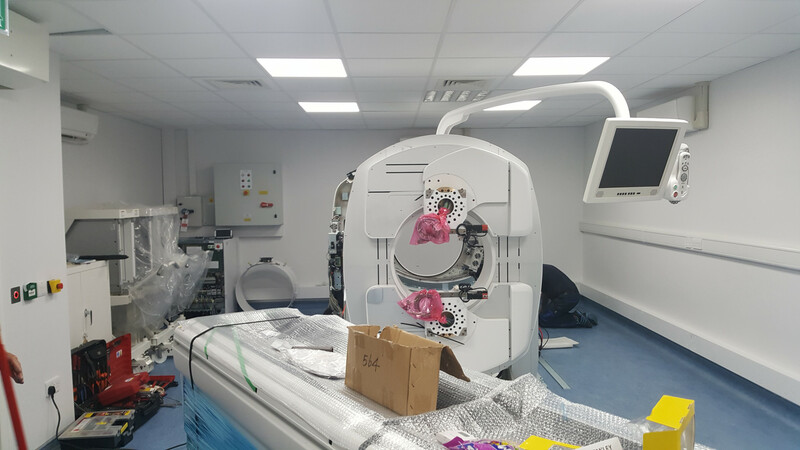 This project consisted of the soft strip of existing rooms within the hospital, establishment of temporary accommodation for surgeons and fit-out of a new photon emission computed tomography scanner room and control room along with the required radiation protection. Cahalane Brothers Ltd won this competitive tender under the HSE Minor Works Frameworks. 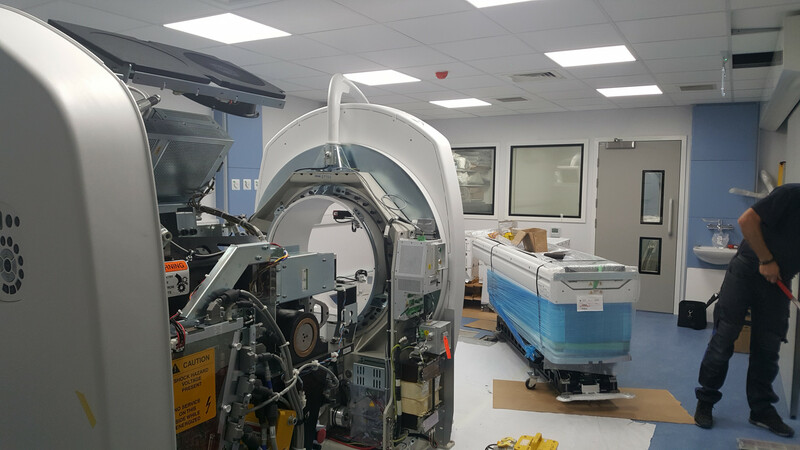 The Radio Diagnotics Department is located centrally in the Cork University Hospital campus, and the area of work was located within the live department meaning all demolition arisings, tools, equipment and materials had to be transported through the live hospital by hand. As part of the 8 week programme of works, Cahalane Brothers Ltd were to form temporary spaces within the hospital for a doctors’ rest room and medical equipment storage, prior to commencing the strip out of the main works area. An existing reinforced concrete dividing wall and adjacent 9” block wall were demolished adjacent to live operating theatres, requiring high levels of noise, dust and vibration control. These works were carried out with carefull consideration given to boh patients and clinical staff. New foundations and a structral frame were installed to support the roof structure and form the space for the new equipment. The new scan room partitions were lead lined with a combination of code 5 and 6 lead to protect patients and staff in adjacent rooms. All service penetrations to the room had to be lead lined and firestopped. Management worked closely with the designers, subcontractors and Radiation Protection Advisor to coordinate the services to reduce the number of penetrations. Air-conditioning, ventilation, electrical services, fire-alarm and lead-lined doors and screens were all installed to a tight deadline to ensure that the new equipment could be installed and operational as quick as possible. The HSE project management and clinical staff noted their thanks for a project completed to a high standard and with careful consideration to the needs of the hospital throughout the works.